September is a month of continued change. Early migrants and shorebirds are starting to arrive and stop over on their way south for wintering grounds. The weather is very slowly starting to cool off in Florida, making longer outings less uncomfortable. This past weekend I used these opportunities to check out the early season action in St. Sebastian River Preserve State Park [map]. A Red-headed Woodpecker – a relative rarity for Brevard County – had been reported off and on in the park this summer, and I wanted to find it. 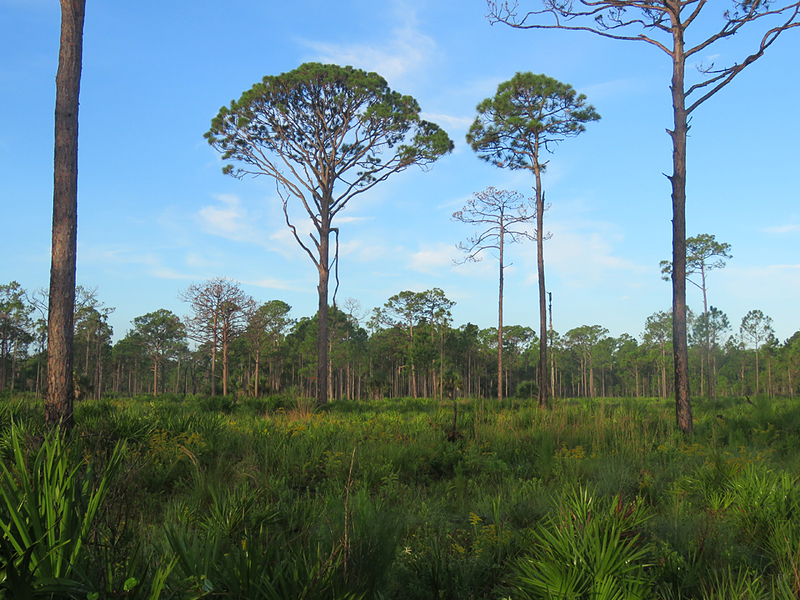 Proper fire management has helped minimize palmetto cover and give the native wiregrass and other herbaceous cover a chance to flourish. 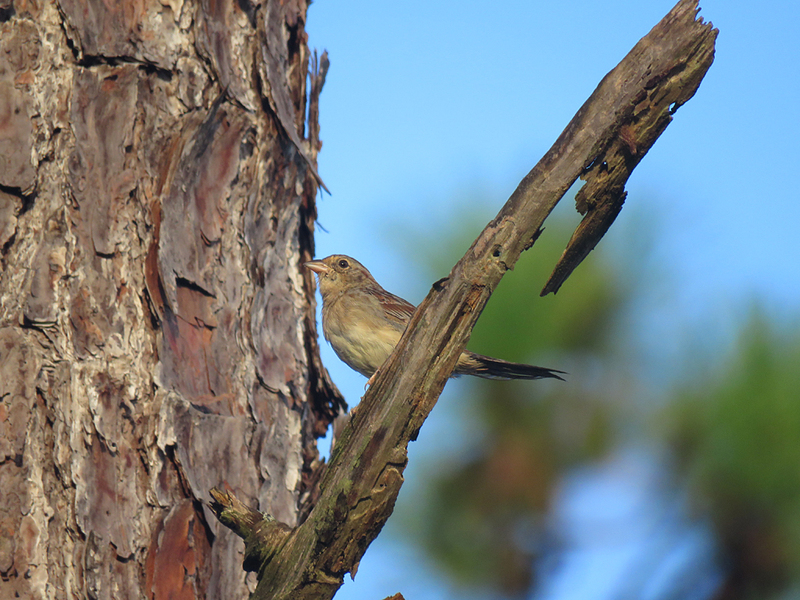 Despite the late summer season, there were still Bachman’s Sparrows singing in the northwest and northeast sections of the park, and several small flocks were flushed out of the palmettos and wiregrass as I walked the Green Trail in the northwest quadrant. Bachman’s Sparrows are often elusive after breeding season, but the birds were active and relatively easy to find. Barn Swallows have been moving through the area for a couple of weeks now, and there were several large groups working various open areas and resting on wires. Quite a number were juveniles, of course. 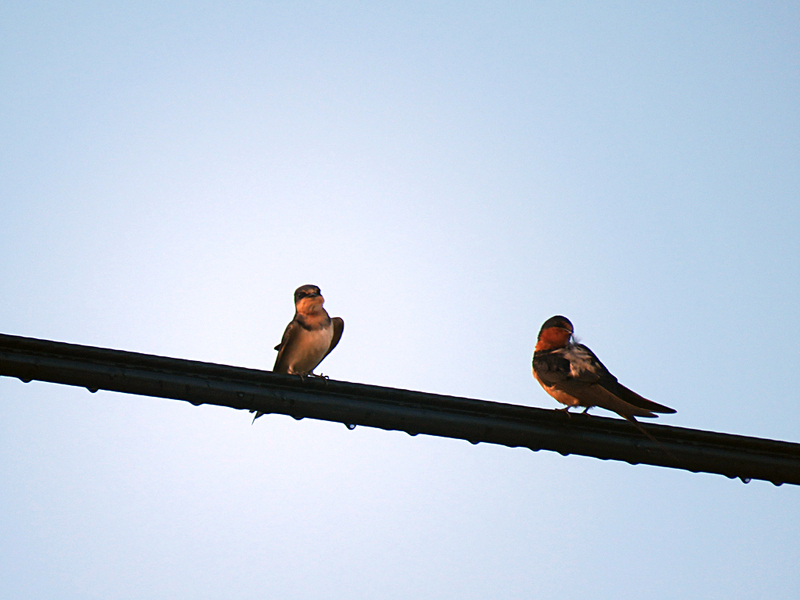 A juvenile (left) and an adult (right) Barn Swallow, preening as they rest in the early morning light. As I hiked part of the Turkey Link Trail, I heard some calls that sounded very much like a Red-headed Woodpecker, some distance to the east. Eventually, I looped back to my car (at the visitors’ center) and drove along the dirt road a bit farther east, near the park service building. After walking about 100 meters north, I could not go any further due to standing water, but I heard some more of the same woodpecker calls not too far away. I decided some judicious audio recordings might help me definitively identify the bird. I played 3 or 4 Red-headed Woodpecker calls and immediately got a reply in some pine trees just about 50 meters away. Unfortunately, I could not locate the bird visually, and eventually the bird moved further into the park and to the east. 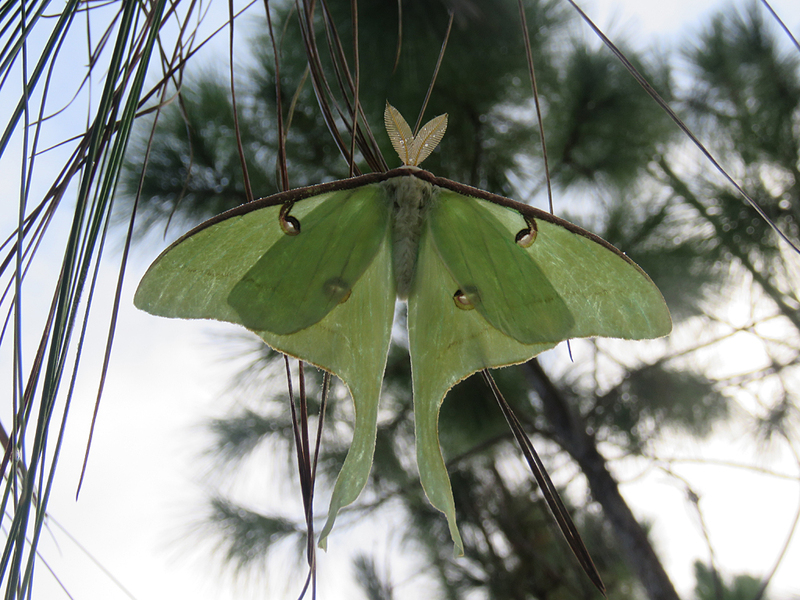 While on the Green Trail I encountered some of the area’s non-avian friends, like some understandably skittish deer and a very cooperative and beautiful Luna Moth species. 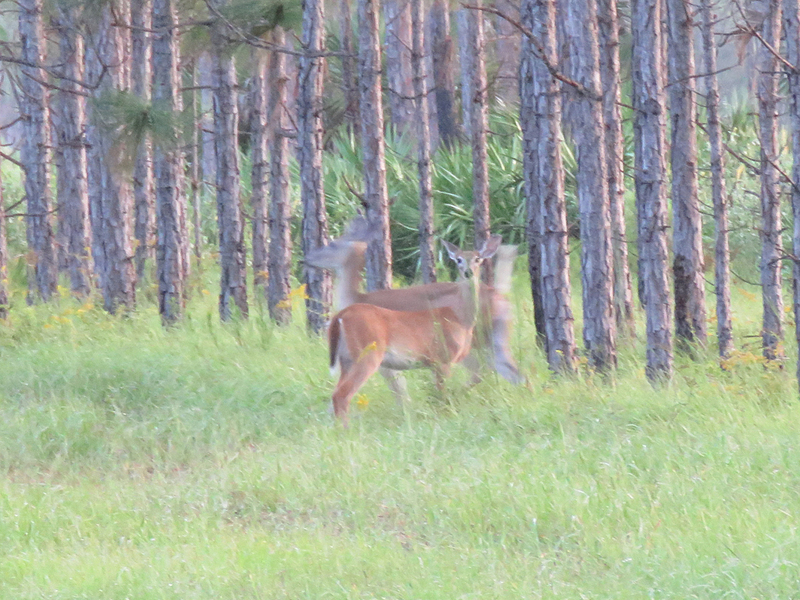 At least one of the deer stood still long enough for a photo! Everyone else was too fidgety and flighty, but I kind of like the blurred aesthetic. A beautifully back-lit Luna Moth, about the span of my hand (over 10 cm or 4 in). I was also surprised by a loose aggregation of Peregrine Falcons a couple of hundred meters overhead. I have seen falcons (Merlins) migrating south (along the beach) in relatively close proximity, but never the larger Peregrines. After making my way back to the car, I drove over to the Yellow Trail at the Northeast Quadrant. The nearby canal had a few wading birds and even a small flock of Wild Turkeys. 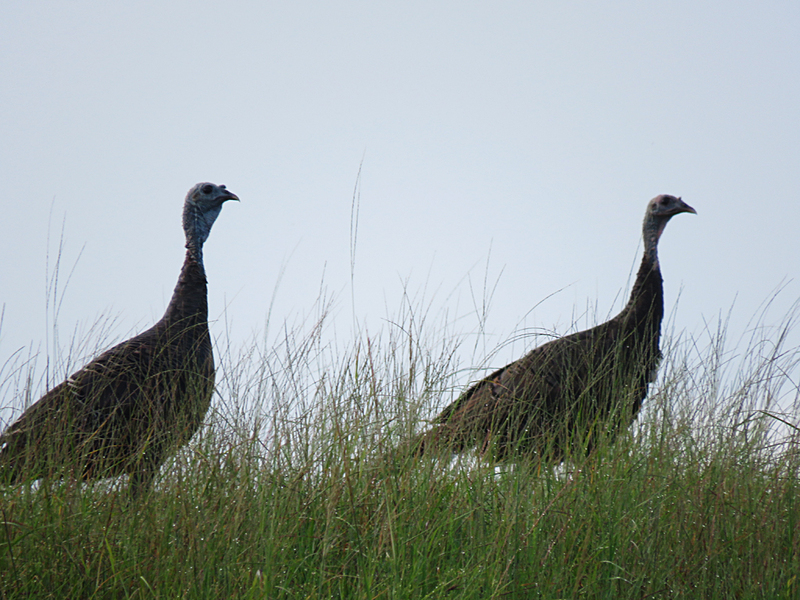 A couple of Wild Turkeys on top of the canal berm. 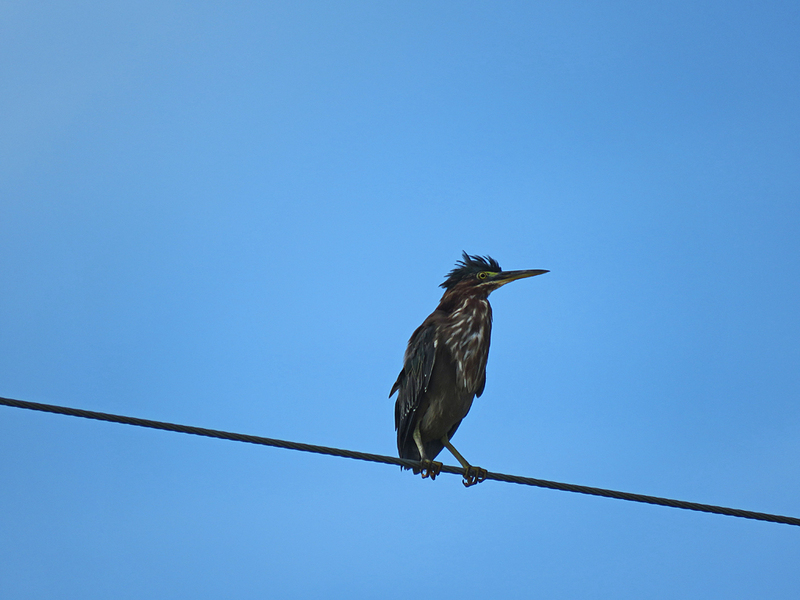 A slightly bedraggled looking Green Heron, near the manatee viewing and fishing area. 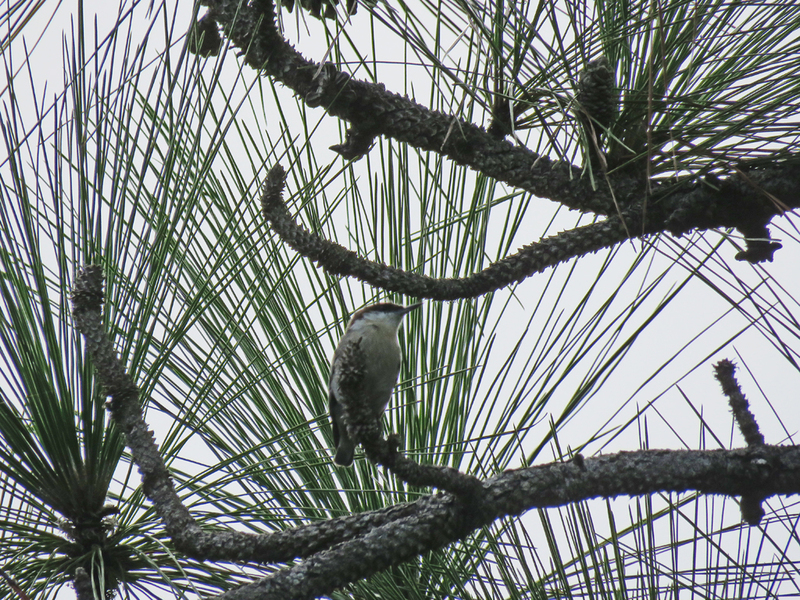 I was anticipating a long walk along the Yellow Trail before seeing any Red-cockaded Woodpeckers, but I was pleasantly surprised by an overflight of two of the woodpeckers, only a few hundred meters from the trailhead. A few Brown-headed Nuthatches also popped by for a quick hello. A Brown-headed Nuthatch pausing just long enough for a photo. 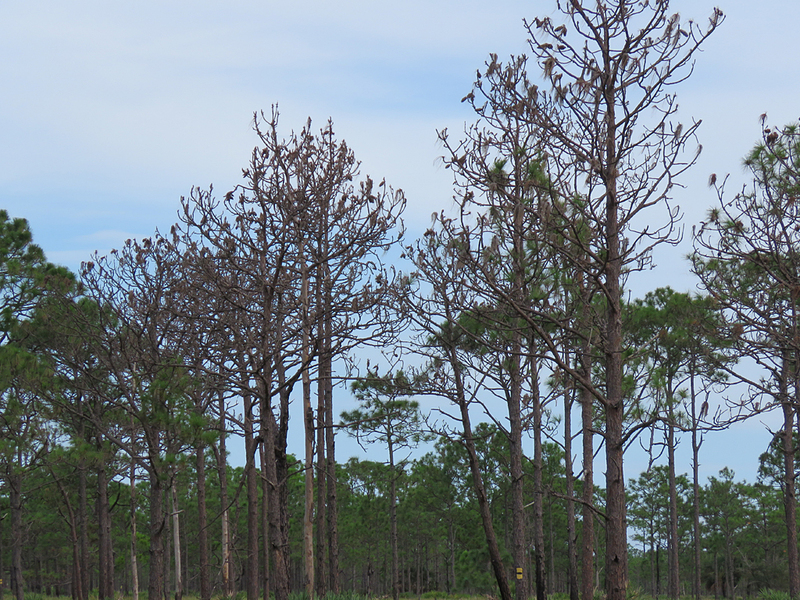 In the aftermath of both Hurricane Matthew in 2016 and Irma in 2017, many of the longleaf pines in Florida have been getting further decimated by the Southern Pine Beetle. For example, at Turkey Creek Sanctuary as many if not more trees are being lost to the beetle than to Hurricane Irma. The beetles take advantage of weakened or diseased mature trees, so the affects of recent hurricanes have helped intensify the current infestation. I did not notice too much in the way of damage in the Northwest Quadrant, and most of the Northeast Quadrant seemed healthy until I ran into a couple of clusters of dead and dying pines on the Red-cockaded Woodpecker Link Trail. Luckily, there didn’t seem to be many affected trees (at least that were within my visual range). Dead trees, no thanks to the Southern Pine Beetle. As I made my way along the Red-cockaded Woodpecker Link Trail the weather, which had been slightly threatening all morning, started to worsen a little and some light rain began to fall. Besides some Pine Warblers and a few other birds, it became quiet as I made my way across a drainage feature around a cypress dome and finally back out onto the Green Trail. I misjudged the distance and wound up walking over 9 kilometers (over 5.5 miles)! St. Sebastian River Preserve State Park is a nice gem at the southern end of Brevard County and northern end of Indian River county. It is bisected by Interstate 95, running north-south, and the channelized Saint Sebastian River (essentially a canal), running east-west. I find myself wondering if a set of elevated wildlife corridors spanning these features could benefit the park and local environment. Such corridors have been widely successful in many places here in the U.S. and around the world. Something to think about. Here are my eBird lists for those so inclined. Posted on 2018 September 4 2018 September 20 by Lonely BirderPosted in BirdingTagged Birding, birds, birdwatching, St. Sebastian River Preserve State Park. Thanks for this account! I’m excited about this month’s birding opportunities, and definitely want to go to St. Sebastian now that I have read your post. That’s fantastic! It’s a beautiful place.